This movie is not, technically, a very good movie. The art's pretty decent -- one can tell they had a higher budget for this movie than for the TV series -- the soundtrack's fine but not outstanding, the characterization is about what you'd expect for a Prince of Tennis movie (i.e. minimal), and the plot is frankly ridiculous. In fact, this movie is ridiculous and over-the-top in a number of ways, and that's exactly what's so great about it. It takes the &quot;junior high school tennis is serious and manly!&quot; theme of the TV series and turns it up to eleven in ways that deny logic, physics, and the very nature of reality. Underwater tennis on the deck of a sinking ship! Energy-beam tennis that blows people's clothes off! Tennis killing the dinosaurs! Heck, the &quot;play this fixed tennis match... OR DIE!! !&quot; premise alone is pretty amusing. 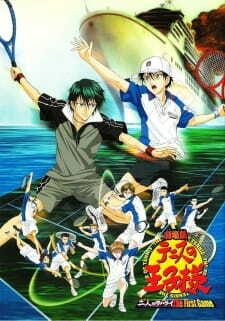 So if you're looking for a serious and realistic sports anime... well, I don't know why you'd be looking at anything Prince of Tennis-related in the first place, but you certainly won't find it here. But if you have a sense of humor and a fondness for shounen absurdity, this movie is a lot of fun. I think the people who made this movie is a bit too hurried to decide on the characters. This movie is totally awesome. With fighting included in tennis, this just excites me more while I was watching the movie. However, there's 2 flaws & disappointments in this movie. 1, the art is bad. Not that bad, but bad. Just by looking at the characters in the anime, example - Inui, you'll know that the author just rushed through some parts of the anime. Second bad thing of the anime (movie): PREDICTIONS. In my opinion, I already know what'll happen, it's so obvious. But every main character nearly always wins. But why is this obvious ....? Judging by Echizen Ryoma and Echizen Ryoga's looks, I already know they will continue the fight after hitting the villian (forgot the name) with the tennis ball. And it's so obvious that Ryoma will win. So I hope the next movie of PoT will not have the same flaw and problem.